THE TWENTY-FIFTH ANNIVERSARY of the Religious Profession of Frs. Paul Arnel “Dodong” Lucero, Reynaldo Bullas and Nelson Cabañerobrought together the Society of Montfortian Missionaries, their junior scholastic counterpart, Totus Tuus Journeyers (TTJers) and the associates of the Montfort Center of Spirituality (MCS) in Madriñan. An added feature that drew a considerable crowd to MCS was the attendant send-off party for Fr. Nelson, who will soon embark on a mission in the United Kingdom. Ergo, they concelebrated the 5:00 pm Mass with their fellow missionary priests in attendance. It was a sight to see them all in the sanctuary, like a guarantee that no rain shall ruin that day’s sacred parade; like the milestone was in heaven made. Main celebrant Fr. 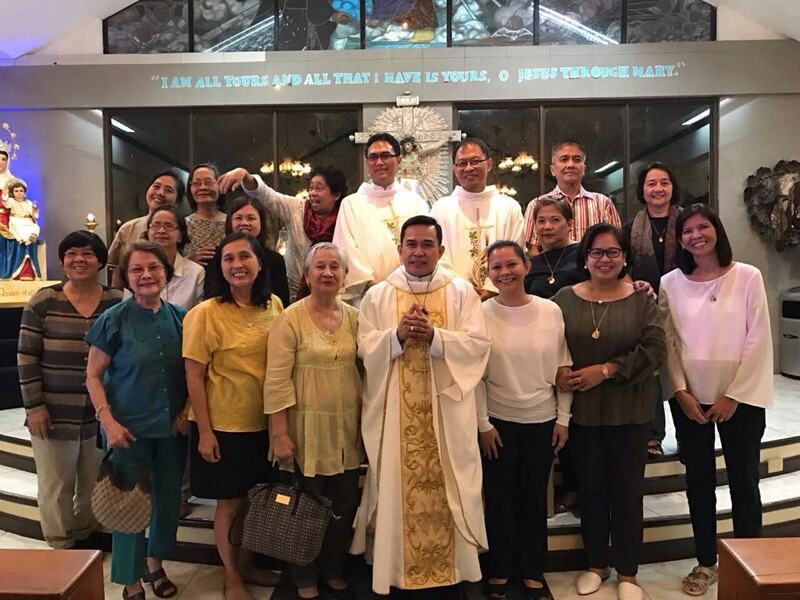 Nelson’s homily declared that he was glad he is still alive and exhorted the congregation to each thank their neighbor for coming, obliquely referring to at least two priests, who came all the way from Pangasinan and Cebu to reunite with fammunity. He looked back to May 21, 1993, his momentous ordination day, and ascribed his joy as running counter to Jonah’s disobedience before the latter was swallowed by the whale. He mentioned Montfort’s motto: If you don’t take risks for God, you won’t do great things for Him, as an obedience slogan that would repeat itself throughout the event. Shortly, Fr. Richard swore them in anew and they professed their vows again. Abrasos accentuated the congratulatory moments, highlighting the temple with a literally moving shades of cream, gold and white, a visual spectacle of fraternity and goodwill. Before the final blessing, Frs. Dodong, Rey (who, the former, a natural joker, said will translate in Italian) and Nelson were given time to express their feelings. Fr. “Joker” qualified that Fr. Rey’s early vacation was due to his sister’s poor health (she was miraculously healed, thanks to the coincidental celebration). He also thanked the TTJers from BF Homes and Sta. Teresita Parish and the doctors who keep them healthy and continue living. Fr. 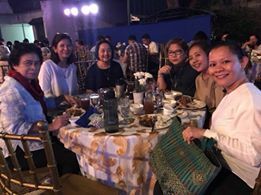 Rey gave gratitude to the Nanays of MCS whom he “grew up with” and who supplied them with toothbrush, toothpaste, soap (laughter) and made them feel not away from home. Fr. Nelson acknowledged the presence of his brother and sister from “Saudi Abra,” (laughter) and cited Fr. Mario Belotti who, however far, reciprocates their updates on the unbroken bond of brotherhood every now and then. He upped the ante on Fr. Rey when he thanked the community and their scholastic juniors and Ates Racquel, Pining, Cita, and so on down the line. Fr. Richard, poised to give them a send-off prayer, picked up one collection bag and proffered it to Fr. Nelson (pabaon daw, he told me later. A priest is not Montfortian if he is without an uncanny sense of humor.) Then he said a solemn benediction. The ensuing program was hosted by Brothers Lester and Precious (from Africa) who briefly introduced themselves before calling on Fr. Sherwin to do the opening prayer. Then the latter joined (and guitar-accompanied) an ensemble of priests and brothers who rendered a Mother-and-Son song in Malawi. Later, Fr. Ordi would return with another sampling of his musicality, a Bahasa Indonesia ditty which he sang and self-accompanied on the organ as well. Asked to add to their earlier brief spiels, Fr. Dodong recalled his fond memories of the last 25 years and quoted three things from Pope Francis: look back with gratitude to God; embrace the present with passion; and look with hope to the continuation of life and mission. Fr. Rey begged to speak in Tagalog (no Italian for this Rome-based Sacerdote), which he missed. He confessed that his heart sank when he heard that the Center was up for sale. It was where they were formed towards a religious life; where they grew up to be available; kahit bunut-bunutin as missionaries. The advice of this youthful 51-year-old was to let God work in us; pray for him, he asked. An intermission of four songs by Jean, a Fatima Soriano voice-alike, made the audience relax. Then a surprise was sprung by a “Brother Act” of five collegian brothers, who pointed at Fr. Fed as their mentor. As if buoyed by that blessedness, three priests and six members of the scholasticate took to the stage. I instantly intuited their number was going to be a winner. Because soon, everybody warm-blooded enough was grooving along with Iñigo Pascual’s Dahil Sa ‘Yo. So infectious was both the dancers and the disc (Frs. Arnel and Norwyn really let their hair down!) Fr. Nelson would not be left out so squeezed himself behind them. The crowd was caught between mild and wild. Up next, Bro. Mark kept the momentum with a swoon factor. He sang Kahit Maputi na ang Buhok Ko and, emboldened by the singing-along audience, got the likes of Frs. Nelson, Ariel, Dodong, Rey and even reluctant Fr. Richard to join him onstage. The banquet gave the multitude pause and Fr. Nelson to relax as he anticipated the emergence of an ace up his sojourning sleeve. At last Fr. Nelson’s surprise guest arrived and he took no time in presenting the fact that the 22-year-old mesmerized him at a function two weeks ago where he celebrated Mass. His brief introduction was followed by the initial strain of the theme song of “The Godfather.” Miguel Aguila did not disappoint; his tenor took on the canned accompaniment well. He had the promise of a professional for even if he forgot the lyrics somewhere (so slightly only the shrewd could sense), one could tell it didn’t rattle him. After “This is the Moment,” he owned the audience, particularly an elderly lady up front who proclaimed that he was good because he looked good. Visibly charming and unassuming, he returned the compliment with a millenial “Perfect,” an Ed Sheeran hit. The lady stood up with another elderly and they swayed to his melody. Miguel knew what kilig meant. He got off the stage and crooned his way to the table where he persuaded Sis Ana Marie to put in the eponymous note. He did a better trick after; gave the mic to Ate Maricar, who hesitated at first but, probably encouraged by his gentle touch, contributed longer lines. In his closing blessing, Fr. Fed summed up the celebration with the notion that three Ms greatly contribute to the spread of the Montfortian enthusiasm: Mary, Montfort and Minds to the mission born. If that was not a fitting finale to a blessed event, explain to me the meaning of perfect.